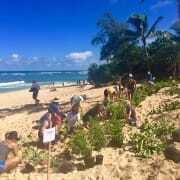 Join us for a volunteer workday at Paumalū (Sunset Beach Park) to plant native coastal plants to help restore the dune! Volunteers will also help with fence and walkway maintenance and construction. Make sure to bring/wear reef-friendly sun protection and a reusable water bottle with plenty of water as we will be working in the sun with little shade. Closed-toed shoes are recommended for construction activities. We’ll be providing water refills, gloves, tools, and snacks. Everyone is welcome!